Although all the smart phones alert us about new updates but imagine it all centered together, on your work table. If you are away from your computer for sometime, the Desktip gives you a compilation of all the things while you were not present. You can simply and easily switch the buttons on the Desktip, which are actually magnets. 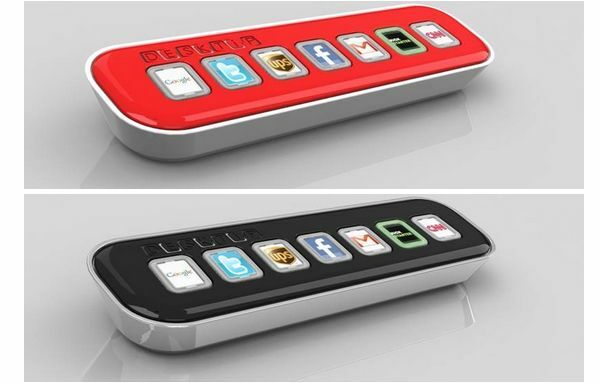 Twenty such buttons or magnets of popular websites are provided. Besides, you can also add your own services which are not in the standard package already. The Desktip has a small disk on key which has the software, and would run on any computer automatically without reinstalling the services. A site listing option helps you correctly define the site you want including the RSS parameters of the particular sites. Desktip users will be able to find new sites of their interest via a list. Though the prototype is working, it still needs some improvement, according to the developers. The software is in the final stages of development. Available in various colors, the Desktip is priced between $49 to $59.